How Big Is a 2 Yard Dumpster? The typical dimensions of a 2 yard dumpster are 6 feet long, 3 feet wide and 3 feet high. These bins hold 2 cubic yards of garbage, or about 24 kitchen-size trash bags. A 2 yard bin usually has a 400 pound weight limit. Disposal costs for this amount of debris are covered by our flat rate price. Keep in mind that, depending on what you’re throwing out, you may hit your dumpster’s weight limit before it’s full. Discuss your waste stream with our team to double-check you’ve got the right size for your business. What’s the Price of a 2 Yard Dumpster? The cost of a 2 yard dumpster rental depends on the location of your business, how often you want your bin picked up, local disposal fees, taxes and any add-ons like lock bars or wheels. 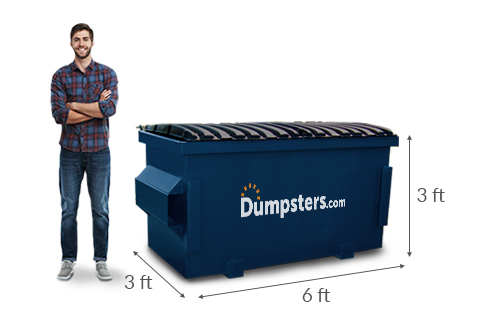 With Dumpsters.com, the price of your 2 yard container is an all-inclusive rate based on all those factors, so it won’t fluctuate month-to-month. This way, you’ll always know what to expect on your bill. 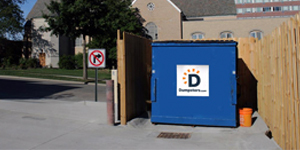 Is a 2 Cubic Yard Dumpster Right for Your Business? Not Enough Room in a 2 Yard Dumpster? 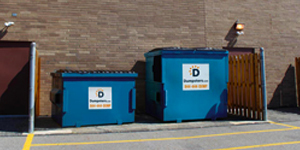 A 2 yard garbage bin is the smallest front load size, but we also offer a range of larger commercial dumpster sizes. If you’re not sure which is best for your situation, give our team a call at [877-880-5286](tel:+877-880-5286) and tell us about your waste stream. And don’t worry about being locked into a certain bin size. Our rental agreements adapt to your business. If your needs ever change, just call us to swap in a larger container or switch to a different pickup frequency. With a shorter contract for your 2 yard trash dumpster, you get more flexibility to move or expand than with the usual 3 - 5 year agreements. Wheels let you easily move your container if needed and a lock bar keeps others’ trash out. Add these features for a monthly fee. A 2 yard garbage bin can hold a wide variety of general trash, ranging from packaging materials and office supplies to food waste. But there are additional fees for disposing of prohibited items in your container. Please call our team with any questions about what can and can’t be placed in your 2 yard dumpster. If you need to get rid of remodeling debris, construction materials or bulky items like furniture, contact us for a temporary roll off dumpster. These rentals handle materials from one-time junk removal and renovation projects.